The Apostle Islands are located in Wisconsin, just east of the Michigan’s Upper Peninsula border and the Porcupine Mountain State Park. 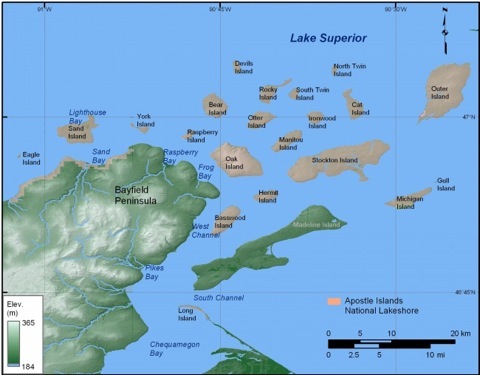 A small peninsula sticks out into Lake Superior, in similar shape to the Keweenaw, and the 22 islands are scattered above its rounded point. The Chippewa tribe considers them as their spiritual home. The Jesuit priest Pierre Francois Xavier de Charlevoix, a historian and explorer (1682-1761), named the twelve largest islands after the Apostles. The Apostle Islands National Lakeshore (a US National Park) is a haven for endangered and threatened species, both plants and animals. The forests on the islands have mostly balsam firs and white spruce mixed with quaking aspen, balsam poplar, white pine, cedar and birch. Bogs and dunes are also found near the lagoons and bays. Black bears inhabit Stockton Island, as well as Sand and Oak Islands – and they may visit many of the other Apostle Islands by swimming or crossing the ice in winter. Nesting birds are common: herring and ring-billed gulls, blue herons, cliff swallows and double-crested cormorants. Eagle Island is a great blue heron rookery, in fact. Sea caves can also be found along the Apostle Islands shorelines, and visitors often come in winter to admire the glistening icicles hanging from the chambers and arches. Before the discovery of iron ore in the Missabe Range made Duluth and Marquette’s ports the most prominent in western Lake Superior, the busiest fur trading center was located at La Pointe on Madeline Island (see map.) The harbor was protected by the northern point of the Wisconsin peninsula and the western Apostle Islands from terrible Lake Superior storms, and from the strong north-eastern winds by the northern half of Madeline Island. Still, ship captains had difficulty sailing to La Pointe – especially without lights to guide them through the narrow South Channel between Madeline and Long Islands. In 1853, Congress had delegated $5,000 to build the La Pointe station on Long Island. However, in 1857 the station was erected on Michigan Island by mistake, far to the north – which didn’t help the harbor of La Pointe at all – and remained unused for over a decade. Due to that serious mistake (either by a Lighthouse Service representative or by the construction crew), the Lighthouse District Board insisted the original contract be honored to build the station they wanted on Long Island to aid harbor traffic. In 1858, the first La Pointe Lighthouse stood a quarter mile from the island’s western tip. A hastily built one-and-a-half story house had a square wooden foundation with a short tower on one side of the roof, making the cast iron lantern only 34 feet above ground. The fixed Fourth Order Fresnel lens was visible from 12 miles away in clear weather. High winds off the water blew the sand away from the foundation and within five years the station became unstable. A work crew added cast iron pipe supports mounted on stone piers under the lighthouse in 1864. A year later, the Eleventh District Inspector proposed that crushed stone be added on top of the sand to reduce further erosion. Unfortunately, delays held up the quarrying and delivery of the stone from Raspberry Island until 1868. 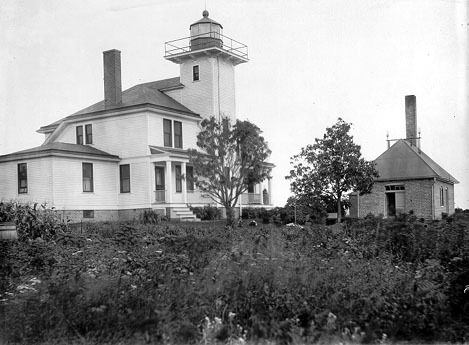 By 1890, the short tower on top of the La Pointe lighthouse proved insufficient given the increased ship traffic between Michigan, Stockton and Madeline Islands. The old fur trading center of La Pointe had given way to Ashland, an industrial port far to the south on Wisconsin’s mainland off of Chequamegon Bay. The Lighthouse Service erected a 70-foot tower next to the steam-powered fog signal that was located far to the east of the original light. Eight years later a 67-foot tower was installed almost a mile away. The station became quarters for a head keeper and his assistant plus their families. The lantern room was then removed from the original station and it served only as keepers' quarters until 1940 when a modern three-family apartment was built closer to the La Pointe tower and fog signal, and the old station was abandoned. 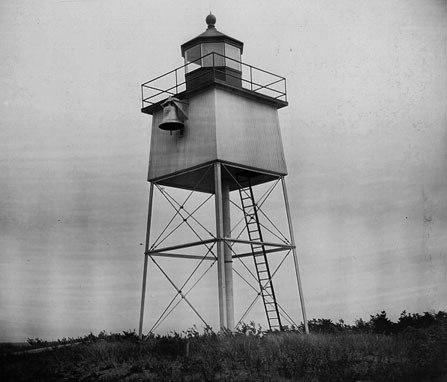 Along with the appropriation for the new light tower, money was provided to mark the southern shore of the channel leading to Ashland with a small tower and fog bell at Chequamegon Point on Long Island. Both lights were maintained by the La Pointe station crew. 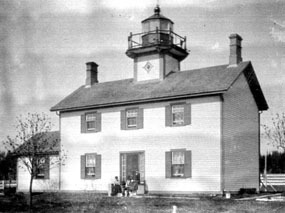 In 1869, the Lighthouse Board activated the unused Michigan Island station by installing a fixed white light and changed the La Pointe station light to a fixed red signal for ships to distinguish between the two. 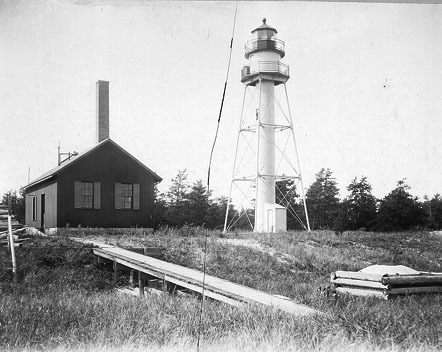 During that time, another lighthouse was approved by Congress – for $6,000 – and built on Raspberry Island, one of the smallest of the Apostle Islands. Begun in 1862, the wood-frame two-story house had a square tower on the roof’s center with access through the attic. 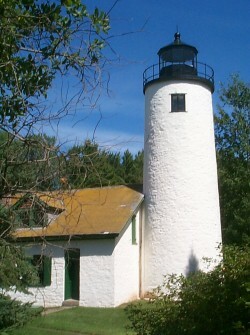 A copper-covered gallery held the cast-iron lantern and Fifth Order Fresnel lens that exhibited a fixed white light with a white flash every 90 seconds. Range of visibility was fifteen and a half miles in good weather, due to the tall bluff where the lighthouse stood. Work was nearly completed in 1863 when the first keeper, Andrew Cramer, moved his family into the attached keeper’s quarters and exhibited first light on July 20th. 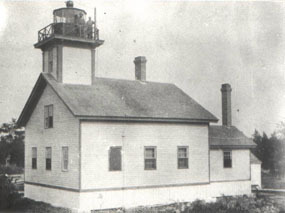 In 1906 the lighthouse was rebuilt, the crew quarters expanded and the light tower was moved to the front of the structure. The light station is one of the few surviving on Lake Superior made of wood, along with the barn, boathouse, two outhouses and dock. A remarkable achievement in light of the extreme weather conditions. The fog signal and oil house were built of brick, however. Automated in 1947, the Raspberry Island light station was transferred to the National Park Service and added to the Apostle Islands National Lakeshore. 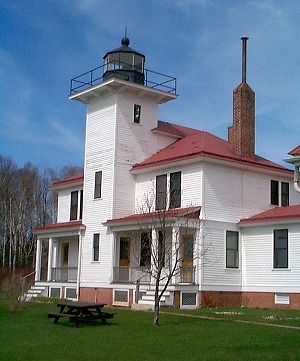 The original Fifth Order Fresnel lens is on exhibit at the Madeline Island Historical Museum. The light now operates as a solar-powered signal on a pole and remains an active aid to navigation on Lake Superior – with a flash of white every two and a half seconds. In 2013, the National Park Service planned a restoration project for April but snow in May delayed the start. Several Apostle Island lights are being renovated at a cost of $7 million. Lighthouses on Michigan, Devils, Long, Sand and Outer islands will benefit. Better public access, repairs and restoration work along with supporting the original foundations, clearing overgrowth of trees and shrubs, and new exhibits will enhance visitors’ tours.